This is without doubt one of our most popular challenges. Climbing the three Highest Peaks in the home nations: Scotland, England and Wales. 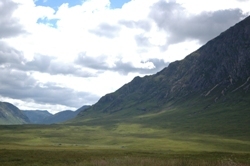 Starting with Ben Nevis, we then head south for Scafell Pike and then finishing at Snowdon. Whilst it is spaced out over 3 days, don't be fooled! This is still a tough challenge! A total of 480 miles of driving, and climbing a total of almost 3000 vertical metres, makes this a special kind of challenge, and not one that everyone is going to manage. You do at least have slightly longer on each mountain, and, thankfully, a bed to sleep in each evening! Why not give yourself a goal this year to train for? 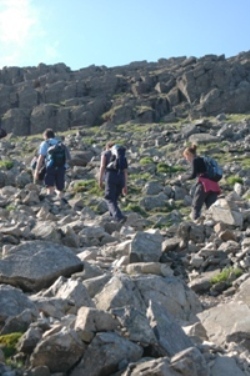 Why not say that you’re going to put yourself to the test, and join the Classic 3 Peaks Challenge? Join a group of like-minded adventurous individuals who will be taking part in this event, looking for a tough weekend, with a few laughs along the way to look back upon. This challenge could change your life - so be prepared! 11:15 (Approx)Early arrival at Glasgow International Airport - then transfer to Fort William. All participants should bring lunches for the day 1 trek with them. 20:00 Expected finish (Typical sunset time during June - August - 8pm to 10pm) - return to eat in Fort William and return to accommodation. Get a good night's sleep ready for another big day! 14:00 Expected departure on Scafell Pike. 20:00 Expected Return to vehicle depart. Leave the Lake District bound for our overnight accommodation and dinner near to Lancaster. 07:00 Expeceted departure from accommodation. Early start again to reach Snowdon. 10:00 Arrive at Snowdon and start trek. 14:30 Approx expected finish - ready for celebratory late lunch. Transfer to lunch venue. After lunch transfer to Chester Train Station (eta 17:00) or Manchester Airport for return journey home. Two nights simple hotel accommodation are included in this itinerary. To find out what previous trekkers have been saying about our events - please click HERE! *All transfers provided by Adventure Cafe's transport provider throughout the challenge from pick up and drop off in Chester/Manchester/Glasgow airport**) on the friday/Sunday. The drivers are regulated by current DVSA drivers hours regulations and enforced driving/rest stops. Please bring lunches for two days. Evening meals . Breakfasts are included in the price of the weekend and will be cooked – vegetarian breakfast is available (please be sure to request it at time of booking. It is possible to hire equipment via our specialist kit hire providers Outdoor Hire Ltd. We have negotiated a 10% discount for all our 3 Peak Challengers. 1. Wear appropriate clothing - including proper footwear with ankle support. 3. Listen to and follow instructions from your leader. 5. Remain well fed and watered throughout the event. 6. In case of poor weather we normally continue to pursue the challenge - unless we deem it unsafe. This usually would entail high winds or exceptionally high water levels that would render river crossings dangerous. Expect variable weather conditions. We are after all trekking at dark, during the day, in Scotland, England and in Wales. So be prepared. We may encounter scorching temperatures but equally freezing cold or even snow (Especially in May on Ben Nevis) pack at both ends of the spectrum. Especially expect rain at some time… all three mountains are on the Western Seaboard and hence bear the brunt of prevailing weather systems coming in moisture laden from the Atlantic.